Visa Checkout is a digital wallet. 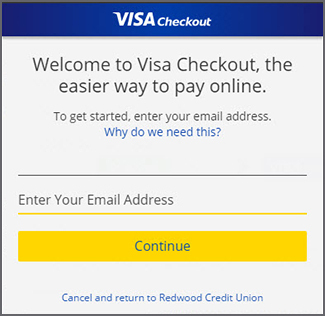 You create the Visa Checkout account and enter the debit or credit cards you want in your digital wallet. Instead of typing your card information to make a payment or purchase, simply enter your Visa Checkout user name and password. Once verified by Visa, your card information will display. Select the card you want to use and follow the prompts. Visa Checkout is a simple and easy way to make payments to RCU loans. You can also use it to make purchases online and theres no cost to sign up with Visa Checkout.